Dr Aideen McInerney-Leo studied Human Genetics as an undergraduate at the University College London and her Masters in Genetic Counselling at the University of Manchester. Following graduation Aideen moved to Bethesda, Maryland to a position at the National Institutes of Health where she remained for the following eight years. During this time she had many roles including assistant director of the genetic counselling training program at Johns Hopkins University, clinical genetic counsellor and researcher counsellor. Research studies included Hereditary Breast and Ovarian Cancer, Turner syndrome, Premature Ovarian Failure and neurodegenerative diseases in general with a special interest in Parkinson Disease. Aideen moved to Australia in 2006 where she accepted a position as a prenatal genetic counsellor at so+gi in Southbank. In 2011 she returned to research at the University of Queensland Diamantina Institute where she got the opportunity to identify new genes for rare genetic disorders, particularly skeletal dysplasias. After a series of fortunate, exciting, discoveries Aideen elected to do a PhD on the analysis of whole exome sequencing for rare disorders and also conduct a qualitative study on illness perceptions in a family with Marfan syndrome. She spent two years at QUT developing a new Masters in Diagnostic Genomics while also exploring the impact of integrating genomics into clinical care of cancer patients. 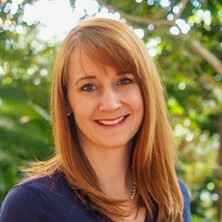 In 2019 she commenced her NHMRC fellowship at UQ on identifying new genes for melanoma and evaluating the extent to which genetic fatalism impacts on sun protective behaviour and surveillance adherence in familial melanoma. Identifying genes causing melanoma and modifying the phenotype and exploring whether genetic fatalism affects sun-related health behaviours in high-risk individuals. COL1A1 C-propeptide cleavage site mutation causes high bone mass, bone fragility and jaw lesions: a new cause of gnathodiaphyseal dysplasia? Duncan, Emma, McInerney-Leo, Aideen, Leo, Paul, Gardiner, Brooke, Marshall, Mhairi, Coucke, Paul, Loeys, Bart, West, Malcolm, West, Jennifer, Wordsworth, Paul, Zankl, Andreas, Brown, Matthew and van Laer, Lut (2013). Whole exome sequencing is a sensitive and cost-effective means of detecting mutations in patients with Marfan syndrome and osteogenesis imperfecta. In: Annual Meeting of the American Society for Bone and Mineral Research, Baltimore, Maryland, (). 4-7 October 2013 .